Playoff time for the 2011 season is finally upon us. At this point in the season, most owners who have failed to make the playoffs have already checked out and started shifting their focus towards next season. That’s fine, but here at Playbook we are as zoned in as ever. We took some time this week to try and figure out what direction to take this week’s blog. After some deliberation we decided that the playoffs are not a time to take a flyer on a sleeper player, but to rely on the guys that got you to this point. So, we have looked at each matchup, picked a big time performer from each then watched the tape to fill you in on what to expect this week. We will let you know what this player does offensively and how that is going to translate over towards the matchup he has at hand. Best of luck to everyone. Steve is arguably one of the best route runners in the NFL. His ability to get clean releases off the line of scrimmage is something everybody at Playbook has taken notice to. Even with teams focusing more attention in Steve’s direction he has still been able to produce. Getting off the line cleanly allows him to work both inside and outside the numbers; making him an easy target for Ryan Fitzpatrick to find. The Dolphins did a good job of shutting Johnson down in the teams Week 11 meeting. The Dolphins had their greatest success when they got up in Johnson’s face and simply ran with him off the line of scrimmage. By not trying to jam him they decreased their chances to be out of position. Vontae Davis, in particular, displayed enough athleticism to stay in Johnson’s pocket while still running with him down the field. Prediction: Johnson has been hot of late and he got open enough in the middle of the field to put up above average numbers this week. The Dolphins will really limit his ability to have a breakout day. 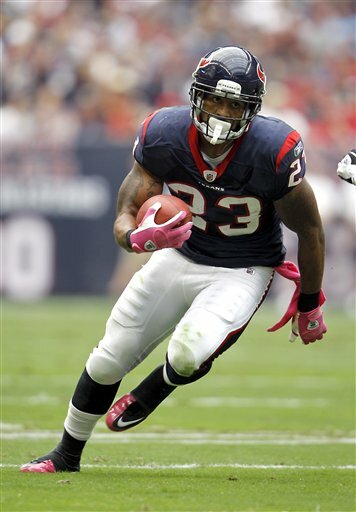 Foster and the Texans zone rushing attack are a perfect match. Foster is at his best when he can plant his foot in the ground and get north and south. One of the traits that makes him unique when looking at other zone running backs is his ability to cutback runs without completely losing his momentum. He displays fluid hips that allow him to adjust him momentum and get up field quickly. The Panthers have struggled all year stopping the run. They lost their two best LBs early in the year and it has showed. The unit they are playing with right now can get washed up very easily at the line of scrimmage. Their instincts are below average which makes them late on reads and causes them to over pursue plays too frequently. 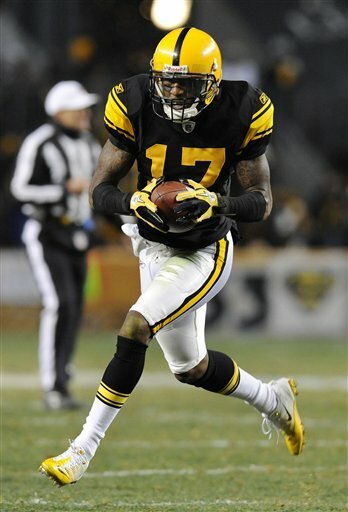 Prediction: Foster has been slowed down the past few weeks, but has a great matchup to put up the same numbers he was during the middle part of the season. In last week’s matchup, Chris Johnson was up against an 8-man box all of his 11 runs. The Saints secondary played extremely well and did a great job setting the edge to limit Johnson’s ability to get outside. The previous week, however, the Titans OL was able to control the line of scrimmage on their lateral runs, which helps their ability to get to the 2nd level defenders. The Colts DL got pushed around against the Ravens and their zone rushing attack. Throughout the game the backside defenders did a terrible job of holding the point of attack. The Ravens backside OL was able to push them up field and create a natural cutback lane for Ray Rice. 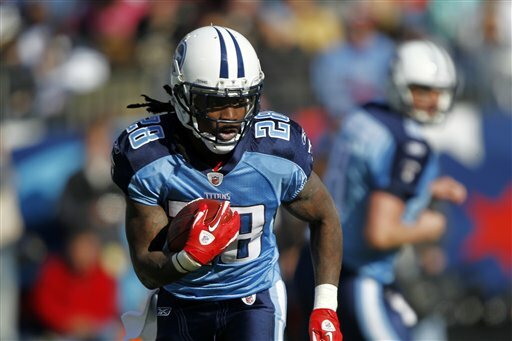 Prediction: Chris Johnson’s vision will be on full display this weekend. He will have no problems getting around the century mark on the ground. 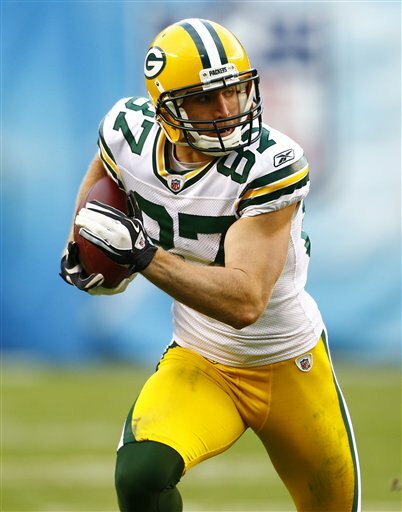 Outside the numbers is where Jordy Nelson does his damage. Nelson has really come into his own this year with his route running ability. Nelson excels at selling plays down the field, throttling down his feet and catching comeback routes. He has shown a good football IQ to understand how to sell an intermediate route so that he can get open down the field. The Chiefs secondary plays a lot of Cover 3. Against the Jets, the Chiefs would roll a Safety down into the box and back their CBs off the WR at the snap of the ball. They showed no consistency with getting physical with WRs at the line of scrimmage which could pose a problem against the talent of the Packers. Prediction: The Packers have too much talent for teams to be able to key on Nelson. If the Chiefs continue to play Cover 3, Nelson will be in complete control and should put up good numbers on the outside. Pettigrew is one of the most complete TEs in football and it shows in how he is utilized in Detroit. Last week he was often held on to help control the edge pressure the Vikings were able to generate. As a pass catcher, Pettigrew has shown he can generate success down the field as well as throttling down underneath the LBs. The Raiders Defense struggles when teams spread them out and force their LBs to cover in space. In coverage the LBs struggle to change direction when they are matched up one on one with a TE. They are not an overly athletic bunch and we think that the Lions passing attack will put them in a lot of uncomfortable positions. Prediction: The attention that Calvin Johnson generates will keep the Oakland Safeties out of the middle of the field. Using 3 and 4 WRs should put Pettigrew in a lot of matchups with a LB, something we think he should be able to exploit. When going up against the Broncos and Champ Bailey, a team’s top WR should not be expected to have a good game. Welker is an exception because he is utilized in so many different positions around the field. Coming out of bunch formations and from the slot, Welker is able to get clean releases which allows him to utilize his quickness and change of direction skills. When he is able to do this, he is nearly impossible for any one player to stop. Against the Chargers in Week 12, the Broncos had a tough time defending their WRs across the middle of the field. In particular, the Broncos struggled to defend against bunches, stack releases and minus splits; all things that Welker uses to his advantage. Prediction: The Broncos will get after Tom Brady a bit which means he will be trying to get the ball out quickly. 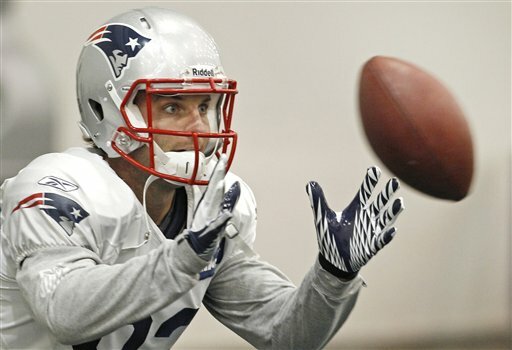 With the New England TEs stretching the defense, Welker should have room to succeed underneath. The Bills tried to cover Gates last week by using Man to Man coverage and putting a LB or Safety on him. 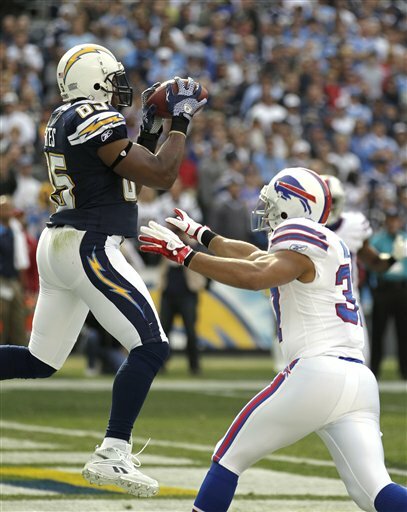 Gates proved that he is still one of the game’s elite TEs and really had his way with whoever was guarding him. As a route runner, Gates has a tremendous ability to locate where the defender is and run his route accordingly. He always seems to be able to generate separation. The Ravens handled the talented 49ers TE duo by slowing them down and forcing them to adjust their routes. They were not overly physical at the line of scrimmage, but they almost always had a LB or TE around 5 yards to make the TEs slow their feet and reroute themselves. The defender often did not carry down the field, but instead kept his focus in the backfield. Prediction: Gates could really be slowed by the Ravens’ ability to generate pressure. The Ravens decision not to carry Gates down the field could hurt them for a big play or two. Gates will put up average numbers, but not nearly at the level he had last week. 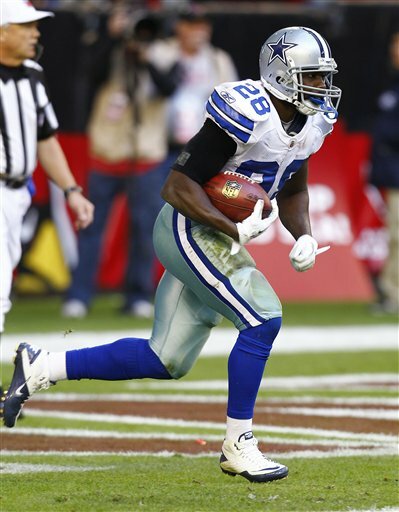 Jones is a much different runner than the player he stepped in for last game, Demarco Murray. Jones displayed some almost uncanny lateral moves around the line of scrimmage last week. Being less of a downhill runner than Murray, Jones is very patient before attacking the hole. His lateral movement makes him very difficult to tackle even if a defender has a clear shot at him. The Bucs run D has really struggled all season. As a unit they do a very poor job at playing gap assignment defense. Their DL do not hold the point of attack well and their LBs do a poor job of holding their gaps in the run game. Prediction: Jones patience around the line of scrimmage will be very effective against the Bucs. Being undisciplined means that Jones should be able to locate some big creases throughout the game. Barber looked fresh last game against the Broncos. His reputation is that he is a physical runner, but his agility is what stood out to us the most. He showed a nice ability to move laterally so that he could hit the hole cleanly. His physical ability came out down the field as he did not hesitate to finish some runs. The Seahawks got beat on the ground last week when they got away from what they do well. Their DL is extremely strong at the point of attack which makes them very difficult to move. When Steven Jackson had good runs, the Seahawks were attacking gaps instead of taking the OL on square. The Rams OL was able to wash them out of the hole and generate a natural running lane for Jackson. Prediction: We believe that the Seahawks come out this week with a vengeance. Going up against a non-threatening passing attack they are going to be able to key on Barber and shut down any openings he might find in the running game. Colston and Brees have shown a great connection with each other the past few weeks. There have been multiple occasions the past few weeks where Brees has kept his focus on one side of the field until the last second where he will readjust and Colston will be wide open down the field. Colston’s size and ability to get open at all spots on the field make him very difficult to take out of a game. The Vikings simply have not been able to cover anyone this season. The Broncos and Lions were both able to torch their secondary down the field and across the middle. The Vikings have not shown that they will play anything else, consistently, besides Cover 2. Prediction: Drew Brees and Colston should have a lot of success this week. Expect Colston to get a few plays down the sidelines and over the middle to put up great numbers. Nicks has been on a tear since he has completely recovered from his hamstring injury. He is running great routes and really utilizing his size to his advantage. By sealing off defenders he is giving Eli Manning a bigger area to throw to and allowing himself a better opportunity to make plays. 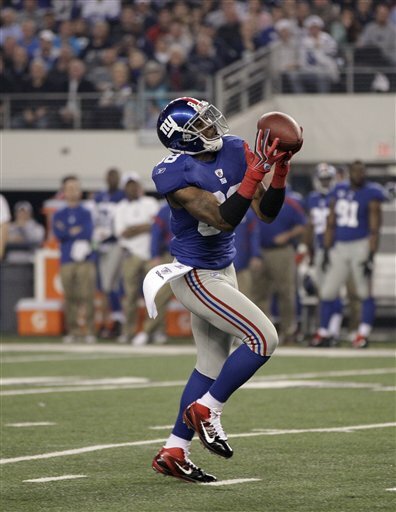 The way Eli Manning is throwing the ball right now, the Giants and Hakeem Nicks are near impossible to completely shut down. Schematically, the Redskins do a good job of changing up their coverage’s. The Skins will get in the WRs face from time to time, but they do not pose any consistent threat to hurt Nick’s ability to get off the line. Production: Nicks and Eli are too in sync to let the Redskins slow them down. With so many offensive weapons the Redskins can’t key in on Nicks and they really do not have any one player who can eliminate him from the passing attack. 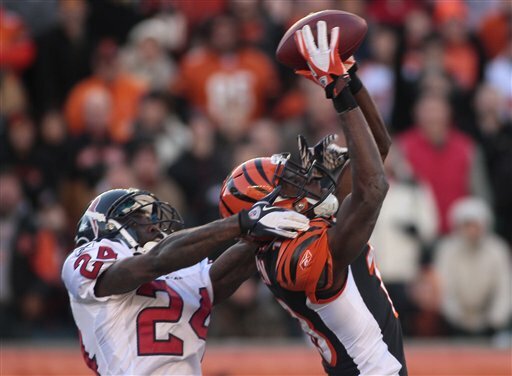 Green has become Andy Dalton’s favorite target down the field. As a route runner Green is very smooth which allows him to get down the field quickly, even on double moves. When the ball is in the air Green possesses a rare ability to stop and attack the ball at his highest point, all before the defender has a chance to react. The Rams were able to slow down a talented WR, in Larry Fitzgerald, by keeping a Safety over the top of him. Fitzgerald was really unable to consistently get open, but the extra Safety in coverage kept 7 players in the box more often than not. Beanie Wells was able to rush for 228 yards because of that decision. Prediction: Being a deep threat Green is always in a position to pick up big points with one throw. After what the Cardinals did to them with having only 7 guys in the box, expect them to keep a Safety closer to the line of scrimmage which should allow Green to get down the field. When the Cardinals are going up against a DL that is not overly strong at the point of attack, they can generate a lot of success. This unit does a great job at getting bodies on bodies, which naturally provides Beanie Wells with holes to run through. Even if they are not blowing teams off the ball, this unit is smart and does a good job of exploiting a player’s lack of discipline and sealing them off when they pick a side to attack. The Browns D has been prone to giving up big games on the ground. The DL does a good job at holding their ground when battling opposing OL face to face. However, on down blocks, this unit is very prone to getting completely washed out of plays. Prediction: The Cardinals OL will control the line of scrimmage throughout the game. Wells should get enough carries to put up above average production this week. The constant running by the Jets eventually wears teams down. Greene is an old fashioned smash mouth running back that seems to be at his best during the later parts of the game. Greene was able to generate 62 yards in the 2nd half without playing the 2nd part of the 4th quarter. His constant pounding allowed him to generate 10 carries between 3-6 yards, with his final carry being for 19 yards. The Eagles are not particularly stout against the run. Their defense is built to rush the passer, not stop a smash mouth rushing attack. As a group they are not particularly strong at tackling which is going to help Greene consistently gain positive yards. Prediction: The Jets will run the ball early and often to help slow down the Eagles’ pass rush. Greene should get enough carries that will allow him to wear down the Eagles front 7 and put up good numbers by the end of the day. With two strong defenses, this game is very difficult to predict in terms of fantasy. For the Steelers, a lot depends on the health of Ben Roethlisberger. At this point in the week he seems like he is going to battle through any pain, but even then he will still be severely hobbled. Wallace’s big play speed is the only real reason we think he could produce good numbers this week. The 49ers are going to come after Big Ben this week and not allow him to get comfortable on his bad ankle. In the secondary, the 49ers have shown an ability to play high-low coverage against teams top WRs and the same should go for Wallace at points during the game. Expect the 49ers to challenge Ben to throw the ball down the field especially if he is severely hobbled. Prediction: Wallace goes into this week as the biggest wildcard of the blog. He is too good of a talent to not play, but there are an awful lot of variables that go into him having a big week.